That’s me, sitting on Abrams, a Longhorn Steer about five years old. He weighs almost a ton! What a sweetheart he was, too! I rubbed his face, scratched his chin, fed him some “steer candy”, wiped my now very slobbery hand on my jeans, and climbed aboard! Clay, his owner, remarked, “You’ve ridden before, haven’t you.” Yes, but that was a long time ago, and never a Longhorn Steer! We listened to some humorous Cowboy Poetry delivered straight from the Longhorn’s back, that included references to the famous West Texas, New Mexico and Colorado cattleman, Charlie Goodnight, who helped blaze the famous Goodnight/Loving Cattle Trail with his buddy, Oliver Loving. These were the same kind of Longhorns that Charlie and his cowboys drove along the trail. When I told them that Charlie was my Great Great Great Uncle, that his sister, Mary Jane Goodnight, was my Great Great Great Grandmother, they invited me over to visit with Abrams for a while. In exchange for getting some pictures of Abrams, and being allowed to sit astride the biggest four-legged ruminant I’ve ever had the privilege of knowing, I told them the story of my GGG Grandmother, Mary Jane, and how she came to be the dis-owned sister of the famous Charlie Goodnight. My GGGrandaddy, Hiram Henry Newton Daugherty, married the widow Charlotte Collier Goodnight when living in Illinois. He was her "next door neighbor" on an adjoining farm, and her husband, Charles Foxwing Goodnight had just died five months previously. Hiram Henry became stepfather to her five kids, including Charlie, Jr. and his older sister, Mary Jane. The whole Goodnight Clan, including Henry and Charlotte and their now blended family, emigrated to the Republic of Texas in 1845 and settled near Houston in Milam County. At some point in 1845-46, Hiram began an affair with his 16 year old step-daughter, Mary Jane. When Charlotte discovered the affair, she kicked them both out, of course, along with Hiram Henry's two children, Mary Jane's step-siblings, George and Caroline. What made this situation even worse was that Charlotte was pregnant at the time with she and Henry's third child, Lucinda. Henry and Mary Jane settled in Washington Co with Hiram's two children, George and Caroline, and, by now, two of their own. (Hiram Henry, Jr. was born in 1848 and his brother, Francis Marion was born in 1849). Charlotte divorced Henry "for cause", and Hiram Henry and Mary Jane were married in Washington Co., Texas sometime in 1846 (records show both 1846 and 1850 for marriage dates. I believe they married in 1846 but did not record the marriage until 1850 based on documents found.) No official divorce record has been found, as the courthouse in Milam Co. TX burned in 1864, but it is apparent that Charlotte divorced Henry post haste. Henry and Mary Jane raised fifteen children all together: the two that were Hiram Henry’s children with Charlotte, and twelve of their own. Henry died there in Milam, Texas on Dec. 27, 1870 at the age of 61 and is buried in Mount Homer Cemetery in Milam, Texas, (my family records say "Rockdale, near where they used to live"). Mary Jane then moved with her son, Jasper Newton Sr., Frank and Mart Daugherty and their families across Texas to Nolan County. Around 1885 they decided to migrate west and eventually settled in the Sacramento Mountains of southeastern New Mexico where they homesteaded in several locations near Cloudcroft, in the Weed and Hope area, including most of Otero County, beginning around 1888. Their homestead cabin in Hay Canyon near Cloudcroft was built strong and sure alongside a creek in the canyon, and I have seen it several times, still standing as a monument to perseverance and determination. Mary Jane never again saw or spoke to either her brother or her mother for the rest of her life, such was the price of her sin. She lived a long life, outliving her husband by decades. When her daughter Jane Cave, died, and her distraught husband committed suicide, Mary Jane then raised her daughter's three orphaned children with the help of her son, Mart. Altogether, she raised 17 children. Her children, grandchildren and great-grandchildren all remembered her fondly as a good and loving mother and faithful wife to Hiram Henry. Such is the good news of redemption. In 1919 she had a stroke and died at Lem Daugherty's daughter's, Lottie Allen, in Ballinger, Texas. She is buried in the Ballinger Cemetery, on the Tom Radion lot. I was invited to give a lecture and trunk show about my journey and development as a quilt artist, last week at the Harvey House Museum in Belen, New Mexico. At one time, in the early part of the last century, Belen was a major railroad center, a "hub" city for the Atchison, Topeka and Santa Fe Railroad. The Harvey House Restaurants, built by Fred Harvey were elegant eating establishments that lined the north-south route and featured first class dining, an extensive menu and fine linen, crystal and silver. And of course, the renowned Harvey Girls, young women of impeccible reputations who were trained in the fine art of serving fine food to the railroad customers. They lived upstairs in the Harvey Houses, in dorm style rooms, were closely chaperoned and developed reputations for excellent service and high standards. Belen has lovingly preserved their beautiful Harvey House and made it into an historic museum with exhibits changing monthly. The rooms of the Harvey House Museum were filled with quilts of all colors and descriptions. They were all made by charitable groups to be given away at hospitals, nursing homes, police stations, anywhere some comfort was needed. It was a privilege to be surrounded by such graciousness and talent! So, here I am, at the beginning of my lecture to a room full of quilt lovers, men and women both. I showed a dozen quilts that I chose from those remaining in my possession dating back to the very beginnings of my quilt art journey, in 1988 that I felt represented my development as an artist and showcased what I learned along the way. My early work was all done in squares with the emphasis on color, like the first quilt shown, called "Four Corners" made in 1988. 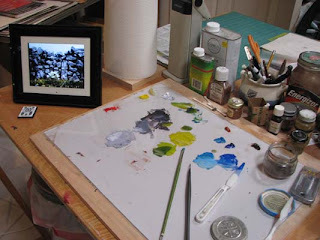 I learned that "Color, pure or muted, is its own magic" and "gradations attract, enfold and please." "Purple Flower Woman", in the next pic, was made in 1992. By now I was doing much more than dyeing solid colors. I was experimenting with many different kinds of "surface design" techniques. I learned that "Squares and triangles give strength and stability. Patterns fascinate, involve and deceive. Repetitions are to forms what beats are to music. The obvious is enchanted by the hidden. Soft edges invite caress and touch." "Sand Tracks", made in 2000, won the best of show at Fiber Celebrated International 2001. It is made mostly from silks and fine cottons and is based on the idea of the force of wind in the southwest. It is collaged and contains actual polished stone beads sewn to the surface. The final piece pictured here is "Elements" made in 2001. It began as a playful exercise in composition using leftover pieces from previous work. After I had made a couple of blocks, I got an idea for a complete quilt, finished up the blocks and dyed the background fabric in cotton sateen in a shibori-style gradation representing the transition from water to earth to sky. I made my last quilts in 2003. Since that time, I have been painting in oils! http://www.katywidger.com/ Just click on the Paintings in Hand Dyed Fabric link to see more! Here’s the final painting. I spent the morning sketching the wildflowers I thought I might put in the painting. As you can see, the flowers are quite tiny in the actual painting, but it helps to know what shapes they assume in real life, even if you’re painting them in miniature, almost as “suggestions” rather than as flower portraits. The sky came from another photo of Ireland, and I was interested mostly in the light and movement of color from bright blue to graying, with a hint of stormy weather. I tried to capture the idea of the sun shining from the upper right, down across the mid-section of the wall, onto the daisies. 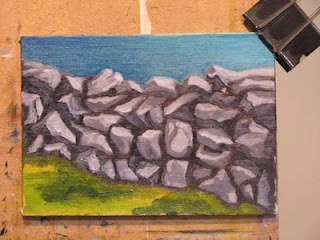 And, I have to admit, this was a bit of a challenge, trying to get the rocks to look like a loosely-stacked field stone wall, with all their odd shapes and the deep shadows with the sky peeping through here and there. 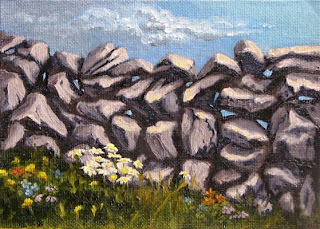 Maybe, perhaps, someday I’ll go to Ireland and see an actual field stone wall for myself! Here, we’ve got the stone wall roughed in using three values of the beautiful, mauve grey mixture of Ultramarine and Terra Rosa. Looking at a blow-up of the photo tells me that the stone has lots of color! Pale mauves, rosy tones and deep blues. That will be fun to paint! Also, the sky peaks through the stones in many places, which will make it "sparkle" with light and integrate the sky, wall and foreground. I’ve decided that the light will be coming from the upper right hand side, and shine down, across the mid-section of the wall, and highlight the flowers that will be growing there, in that dark green spot, towards the left hand center at the base of the wall. Those will be white daisies. There will be other flowers, scarlet, purple, blue and yellow, along the wall, as well. The sky will be lighter towards the right hand corner, a more cerulean blue. It will move to a darker, greyer sky on the left side. I’m using Cerulean Blue and Ultramarine for the sky, and adding some Cadmium yellow for the ground. It’s mostly a thin, transparent wash, with just a tiny bit of white added to the Cerulean Blue on the right hand side, where the sky will be lighter. This is the first “statement”; an underpainting that will serve as the first layer to this small, 5" x 7" painting. It is applied thinly and mostly in a transparent wash of pure hues. Almost all of it will be painted over in the next “statement”, subduing most of the brightest colors, but allowing them to “shine” through in some areas . Right now, I’m going to let this dry and come back again on Monday morning and finish it, hopefully, that day. Kathy and a good friend took a trip back across the pond to Ireland in 1972. A trip of a lifetime, back to her homeland, right out of college. What grand fun they had, driving on the “wrong” side of the road, touring the Irish countryside, kissing the Blarney Stone, soaking up the shamrock fields, the blue Irish sky and the enchanting culture of her ancestors! She snapped dozens of photos on her little Brownie camera, and was especially fond of all the field stone walls that lined country land and highway. Just a long pile of rocks, mostly, cleared from adjoining fields, bounding land and keeping sheep from wandering too far. She’s asked me to paint one for her, from one of those little Brownie pics from ’72. Here’s the first step: Palette set up for this first “statement” is simple: Just some Ultramarine Blue and Terra Rosa, mixed together with a bit of Titanium White to make a beautiful grey. We’ll use that to start in on the rock wall. I’m going to “move” the wall and angle it to give the painting a more dynamic interest. The photo shows a pale, washed-out sky, which means it was probably an overcast day with diffused sunlight. Since there’s no strong directional sense to the sunlight falling on the wall, it's kind of bouncing around all over the place, we’ll “manufacture” one. I’ve never been to Ireland, but I’ve got some great magazines to look at (Ireland of the Welcomes) and the internet is a wealth of wonderful, well-lit photos of Ireland with true colors, to give me a sense of the light and colors there. I’m using my digital frame for all the reference photos I’m using, which back lights the digital images, and gives a more true-to-life picture than a printed photo would.